How to return the favour? It sleeps on benches beneath stars. The King of the worlds? at your feet, Beloved Master? that One might lift me. I had to dust and sweep. placed it in the kiln. if the Beloved is not thirsty? if the Beloved does not lift it up? 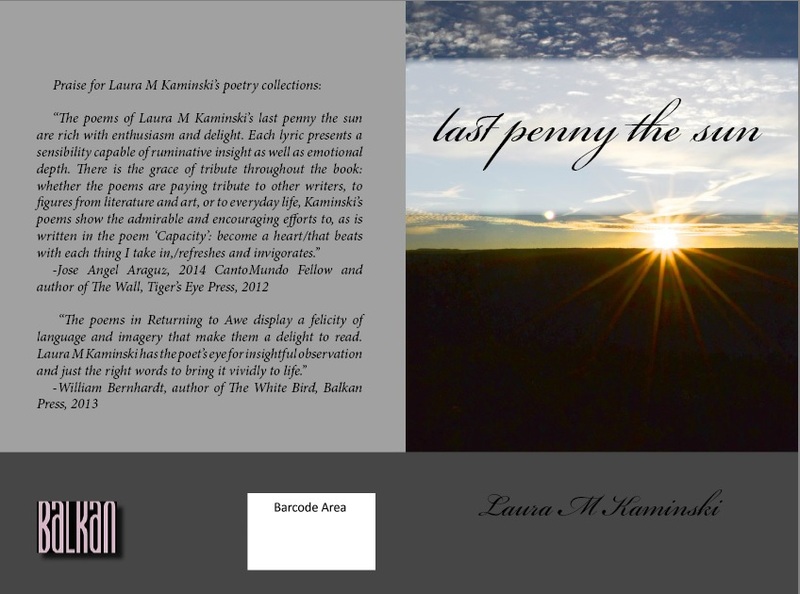 last penny the sun is now available on Amazon! The lovely cover photo is “Sun Shot” by my niece, Madeline Kaminski. insecurities and all fear of rejection. table for that frumpy fellow watching from the branch. down the trunk and grab the gift, race back up skyward home. manna falling from the sugar maple into new spring clover. this kind of banquet. May even the crumbles of this day be joy. THIS IS A GOOD TIME TO BUY NEW SHOES. gets shopping advice from a restaurant biscuit? burst free from the wings for a round of high-fives. have seen past it, I might have missed these joys. and, like poems, re-ingests them. I must take it up.